1 - What is the Le Châtelier principle? The previous lesson emphasized the dynamic character of equilibrium as expressed by the Law of Mass Action. This law serves as a model explaining how the composition of the equilibrium state is affected by the "active masses" (concentrations) of reactants and products. In this lesson, we develop the consequences of this law to answer the very practical question of how an existing equilibrium composition is affected by the addition or withdrawal of one of the components. 1 What is the Le Châtelier Principle? If a reaction is at equilibrium and we alter the conditions so as to create a new equilibrium state, then the composition of the system will tend to change until that new equilibrium state is attained. (We say "tend to change" because if the reaction is kinetically inhibited, the change may be too slow to observe or it may never take place.) 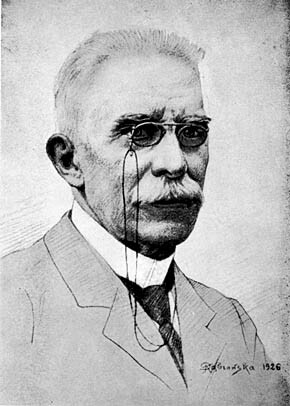 In 1884, the French chemical engineer and teacher Henri Le Châtelier (1850-1936) showed that in every such case, the new equilibrium state is one that partially reduces the effect of the change that brought it about. Le Châtelier principle: If a system at equilibrium is subjected to a change of pressure, temperature, or the number of moles of a component, there will be a tendency for a net reaction in the direction that reduces the effect of this change. Consider an arbitrary mixture of these three components at equilibrium, and assume that we inject more hydrogen gas into the container. Because the H2 concentration now exceeds its initial equilibrium value, the system is no longer in its equilibrium state, so a net reaction now ensues as the system moves to the new state. The Le Châtelier principle states that the net reaction will be in a direction that tends to reduce the effect of the added H2. This can occur if some of the H2 is consumed by reacting with I2 to form more HI; in other words, a net reaction occurs in the reverse direction. Chemists usually simply say that "the equilibrium shifts to the left". Disruption and restoration of equilibrium. At the left, the concentrations of the three components do not change with time because the system is at equilibrium. We then add more hydrogen to the system, disrupting the equilibrium. A net reaction then ensues that moves the system to a new equilibrium state (right) in which the quantity of hydrogen iodide has increased; in the process, some of the I2 and H2 are consumed. 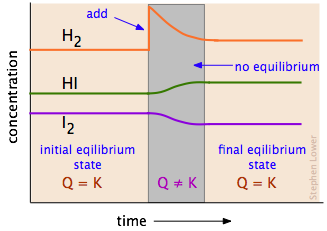 Notice that the new equilibrium state contains more hydrogen than did the initial state, but not as much as was added; as the le Châtelier principle predicts, the change we made (addition of H2) has been partially counteracted by the "shift to the right". The following table contains several examples showing how changing the quantity of a reaction component can shift an established equilibrium. NaCl(s)+ H2SO4(l) → Na2SO4(s) + HCl(g) reaction is carried out in an open container Because HCl is a gas that can escape from the system, the reaction is forced to the right. This is the basis for the commercial production of hydrochloric acid. HCN(aq) → H+(aq)+ CN(aq) the solution is diluted Shift to right; the product [H+][CN] diminishes more rapidly than does [HCN]. AgCl(s) → Ag+(aq)+ Cl(aq) some NaCl is added to the solution Shift to left due to increase in Cl concentration. This is known as the common ion effect on solubility. N2(g) + 3 H2(g) → 2 NH3(g) a catalyst is added to speed up this reaction No change. Catalysts affect only the rate of a reaction; the have no effect at all on the composition of the equilibrium state. 2 How do changes in temperature affect equilibria? Suppose this reaction is at equilibrium at some temperature T1 and we raise the temperature to T2. The Le Châtelier principle tells us that a net reaction will occur in the direction that will partially counteract this change. Since the reaction is endothermic, a shift of the equilibrium to the right will take place. 3 How do changes in pressure affect equilibria? is in equilibrium at some arbitrary temperature and pressure, and that we double the pressure, perhaps by compressing the mixture to a smaller volume. From the Le Châtelier principle we know that the equilibrium state will change to one that tends to counteract the increase in pressure. This can occur if some of the NO2 reacts to form more of the dinitrogen tetroxide, since two moles of gas are being removed from the system for every mole of N2O4 formed, thereby decreasing the total volume of the system. Thus increasing the pressure will shift this equilibrium to the right. It is important to understand that changing the pressure will have a significant effect only on reactions in which there is a change in the number of moles of gas. Δng = (nproducts  nreactants) = 1  2 = 1. Δng = 0 and pressure will have no effect. CaCO3(s) → Ca2+ + CO32. There is a slight decrease in the volume when this reaction takes place, so an increase in the pressure will shift the equilibrium to the right, with the results that calcium carbonate becomes more soluble at higher pressures. The effect of pressure on a reaction involving substances whose boiling points fall within the range of commonly encountered temperature will be sensitive to the states of these substances at the temperature of interest. For reactions involving gases, only changes in the partial pressures of those gases directly involved in the reaction are important; the presence of other gases has no effect. Given the following boiling points: CH4 (methane) = 161°C, H2O = 100°C, CH3OH = 65°, H2 = 253°C, predict the effects of an increase in the total pressure on this equilibrium at 50°, 75° and 120°C. Solution: Calculate the change in the moles of gas for each process,taking into account the effect of temperature on the states of methanol and of water at the higher temperatures. 4 What is the Haber process and why is it important? The Le Châtelier principle tells us that in order to maximize the amount of product in the reaction mixture, it should be carried out at high pressure and low temperature. However, the lower the temperature, the slower the reaction (this is true of virtually all chemical reactions.) As long as the choice had to be made between a low yield of ammonia quickly or a high yield over a long period of time, this reaction was infeasible economically. Nitrogen is available for free, being the major component of air, but the strong triple bond in N2 makes it extremely difficult to incorporate this element into species such as NO3 and NH4+ which serve as the starting points for the wide variety of nitrogen-containing compounds that are essential for modern industry. This conversion is known as nitrogen fixation, and because nitrogen is an essential plant nutrient, modern intensive agriculture is utterly dependent on huge amounts of fixed nitrogen in the form of fertilizer. Until around 1900, the major source of fixed nitrogen was the NaNO3 (Chile saltpeter) found in extensive deposits in South America. Several chemical processes for obtaining nitrogen compounds were developed in the early 1900's, but they proved too inefficient to meet the increasing demand. Although the direct synthesis of ammonia from its elements had been known for some time, the yield of product was too small to make the process commercially feasible. In 1905, Fritz Haber (1868-1934) began to study this reaction, employing the thinking initiated by Le Châtelier and others, and the newly-developing field of thermodynamics that served as the basis of these principles. From the Le Châtelier law alone, it is apparent that this exothermic reaction is favored by low temperature and high pressure. However, it was not as simple as that: the rate of any reaction increases with the temperature, so working with temperature alone, one has the choice between a high product yield achieved only very slowly, or a very low yield quickly. Further, the equipment and the high-strength alloy steels need to build it did not exist at the time. 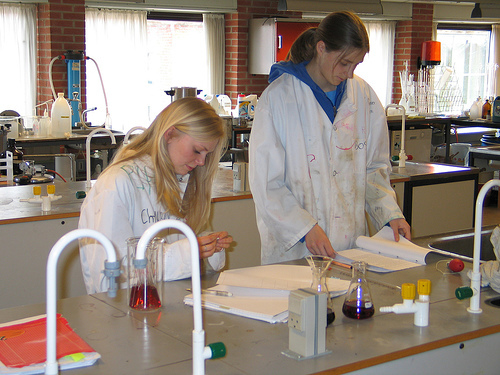 Haber solved the first problem by developing a catalyst that would greatly speed up the reaction at lower temperatures. The second problem, and the development of an efficient way of producing hydrogen, would delay the practical implementation of the process until 1913, when the first plant based on the Haber-Bosch process (as it is more properly known, Carl Bosch being the person who solved the major engineering problems) came into operation. The timing could not have been better for Germany, since this country was about to enter the First World War, and the Allies had established a navel blockade of South America, cutting off the supply of nitrate for the the German munitions industry. Much has been written about some of the more controversial and tragic aspects of Haber's life. 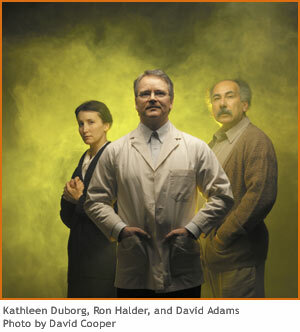 Shown here are the major figures in the cast in the 2005 Vancouver production of Vern Thiessen's play Einstein's Gift which centers on the conflict and tragedy in Fritz Haber's life. His first wife, Clara, was his former student and a chemist; Haber's decision to help Germany develop chlorine as a war gas led to her suicide. See also Thomas Hager's 2008 book The alchemy of air; a Jewish genius, a doomed tycoon, and the scientific discovery that fed the world but fueled the rise of Hitler. 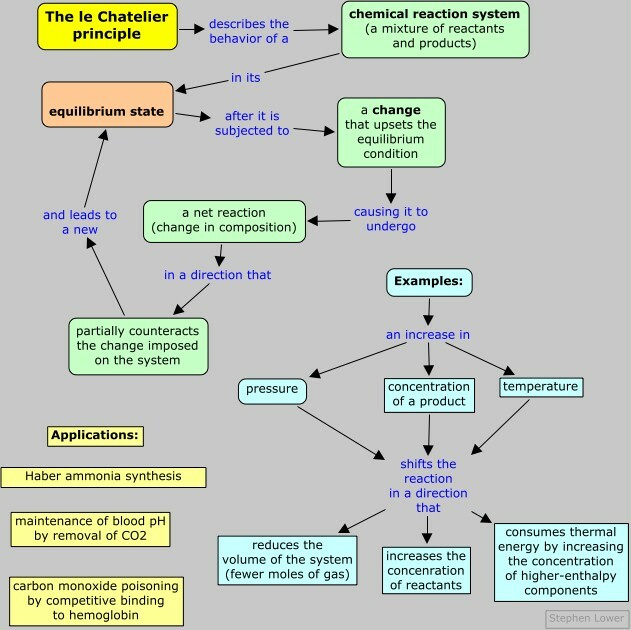 Many of the chemical reactions that occur in living organisms are regulated through the Le Châtelier principle. Much more detail about the mechanism by which hemoglobin transfers oxygen from the lungs to tissues, and then carries carbon dioxide and hydrogen ions back to the lungs, can be found on this Wikipedia page. which is forced to the right by the high local CO2 concentration within the tissues. Once the hydrogen carbonate ("bicarbonate") ions reach the lung tissues where the CO2 partial pressure is much smaller, the reaction reverses and the CO2 is expelled. Make sure you thoroughly understand the following essential ideas which have been presented above. It is especially imortant that you know the precise meanings of all the highlighted terms in the context of this topic. A system in its equilibrium state will remain in that state indefinitely as long as it is undisturbed. If the equilibrium is destroyed by subjecting the system to a change of pressure, temperature, or the number of moles of a substance, then a net reaction will tend to take place that moves the system to a new equilibrium state. Le Châtelier's principle says that this net reaction will occur in a direction that partially offsets the change. The Le Châtelier Principle has practical effect only for reactions in which signficant quantities of both reactants and products are present at equilibrium that is, for reactions that are thermodynamically reversible. Addition of more product substances to an equilibrium mixture will shift the equilibrium to the left; addition of more reactant substances will shift it to the right. These effects are easily explained in terms of competing forward- and reverse reactions that is, by the law of mass action. The classic example of the practical use of the Le Châtelier principle is the Haber-Bosch process for the synthesis of ammonia, in which a balance between low temperature and high pressure must be found. See here for another treatment of the Le Châtelier principle. Henri Louis Le Châtelier: A man of principle - biographical sketch, including his original statement of the Principle. This chapter covers the following topics:Introducing the principle, effects of temperature and pressure on equilibria, the Haber process, some applications to physiology. It can be accessed directly at http://www.chem1.com/acad/webtext/chemeq/Eq-02.html.